Apr. 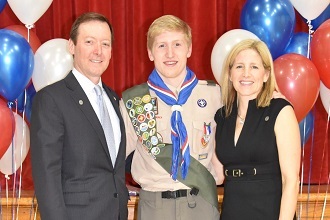 10, 2019: On Sunday, March 24, Bronxville resident Tim Cushman advanced to Eagle Scout, the highest rank possible in Boy Scouts. An Eagle Court of Honor ceremony was held at The Reformed Church. Eagle Scouts are an elite group—only four percent of all Scouts achieve the rank of Eagle. Since Troop 5 was officially re-chartered in 1990 by then Scoutmaster Ray Pfeister, who was in attendance, 78 members have achieved Eagle, with 38 reaching Eagle since 2010. Boasting three generations of Eagle Scouts, the Cushmans are a particularly dedicated Scout family. In attendance was John C. Cushman, III, Tim’s grandfather, past national president (2004-2006) of the Boy Scouts of America. Becoming an Eagle Scout is a journey of commitment, learning, skill, and leadership. In Scouting, the path to Eagle typically takes five to seven years to achieve and must be completed before the age of 18. There are 325 requirements to become an Eagle Scout, including an Eagle Project. Attaining Eagle is a testimony to the strength and commitment of the Scout, the adult leadership, and the family of every Eagle Scout. The Eagle Project is a service project conceived of and planned, funded, organized, and executed under the leadership of the Eagle Scout candidate. An Eagle Scout service project can take months to plan and easily exceed 200 man-hours of work with groups of 20 or more volunteers managed by the Scout. The Children’s Village was founded in 1851. Today it serves more than 10,000 children and families each year, helping society’s most vulnerable children become educationally proficient, economically productive, and socially responsible members of their communities. One of the highlights of the ceremony was Troop 5’s gift to its new Eagle Scout--a version of what the Scout Law’s twelve points mean to Tim’s fellow Scouts in their own words. This was presented by several Troop 5 members: Giovanni LaVecchia (historical overview); Andrew Mager (trustworthy, obedient); JP Denfeld (loyal, cheerful); Will Tinson (helpful, thrifty); Edward Phillips (friendly, brave); Marco LaVecchia (courteous, clean); and Hunter Denfeld (kind, reverent). Ben Mehler acted as master of ceremonies, Andrew Mager conducted the Pledge of Allegiance, Will Tinson led the Scout Oath, the Reverend Michael Bird from Christ Church shared an opening prayer, Hudson Schnier, Aiden Olivari, and Hunter Denfeld performed Color Guard duties, and Jeffrey Modesitt played reveille and taps on the bugle to open and close the ceremony. In addition, the troop gave Tim an Eagle scrapbook to hold letters and certificates from dignitaries and other Eagle memorabilia. Tim has received letters, with more to come, from United States Presidents Jimmy Carter and George W. Bush, NY Senator Chuck Schumer, Governor Andrew Cuomo, Mayor Mary Marvin, Olympic Gold Medalist Michael Phelps, Chairman of the Joint Chiefs of Staff General Joseph Dunford, Jr, Commanding Officer US Navy EC Doyle, Lieutenant General US Army Robert Caslen, Jr, Colonel US Army & Admission Director West Point Deborah McDonald, and Brigadier General US Air Force Edward Thomas, Jr, and certificates from NASA and the National Park Service. Pictured here (L to R): Chip Cushman, Tim Cushman, Tammy Cushman.